How prepared are we for the next big one? RISK ASSESSMENT: Dutch architect Anne Feenstra explains how Malla-era buildings in Kathmandu had in-built flexibility to withstand earthquakes, which later structures do not have. As they walk along the dark, narrow alleys Dutch architect Anne Feenstra and structural engineer Amshu Bhattarai, are shocked. Despite the warning of the 2015 earthquake, much of the new construction flouts basic architectural codes and engineering features. The two stroll from one densely-packed town square to the next, and their expert eyes spot structural faults and vulnerabilities in buildings in which there are multiple families living in partitioned flats. Some have concrete floor additions on top of old brick mud walls, others have cantilevered rooms jutting out and overhanging the street below. “Here, in this one, the lesson is never to copy and paste,” says Feenstra, pointing to a Rana era home with its walls and windows severely out of alignment. 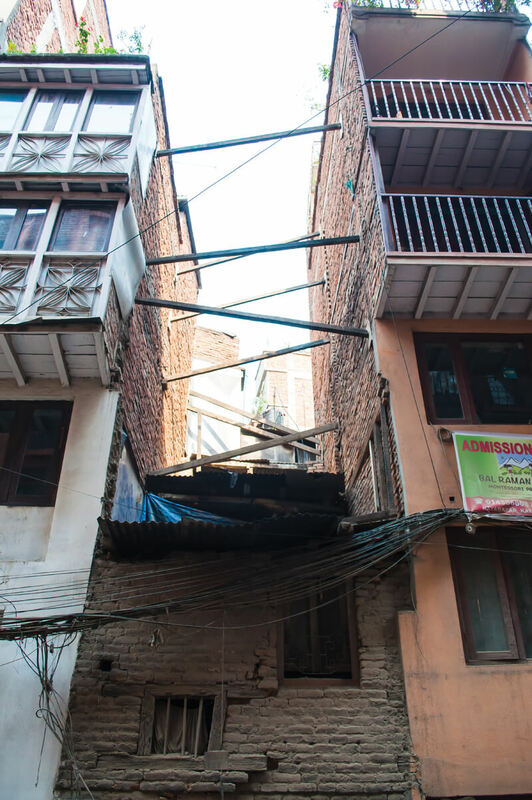 Two post-earthquake constructions with dangerous top-heavy canteliver balconies lean on each other in Patan. Malla period traditional builders interlocked the timber and stones to create flexible but strong earthquake resistant structures. Feenstra explains that the Ranas were more interested in external stucco decoration and not strength, which is why a disproportionate number of Rana-era buildings were damaged three years ago. 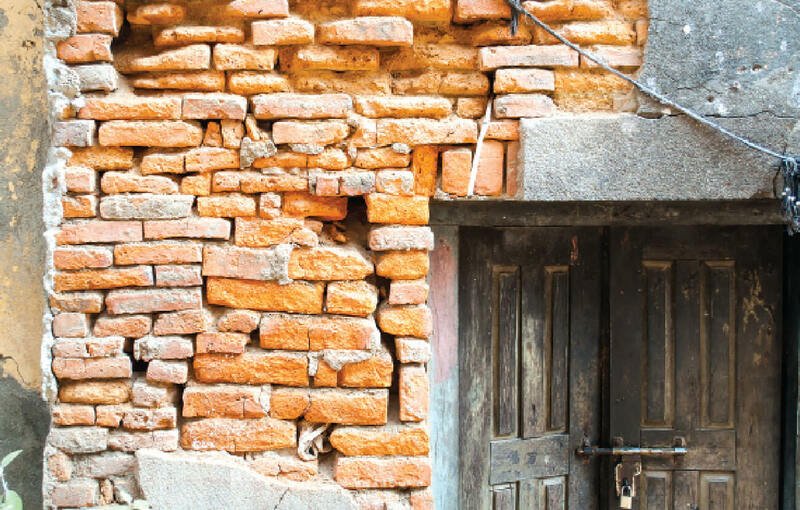 Although most of the houses that collapsed in Kathmandu in 2015 had load-bearing walls with brick-and-mortar masonry, a slightly stronger earthquake that had lasted longer with higher amplitude of shaking would have brought down many concrete pillar buildings as well. Amshu Bhattarai is with the Department of Urban Development and Building Construction (DUDBC) and says the fact that cement buildings survived has given people a false belief that they are stronger. “Some of the concrete pillar buildings like this one here are constructed with just four beams in each corner, this can have disastrous consequences in case of a future bigger earthquake,” Bhattarai explains, pointing to a new building coming up near Mangal Bazar. 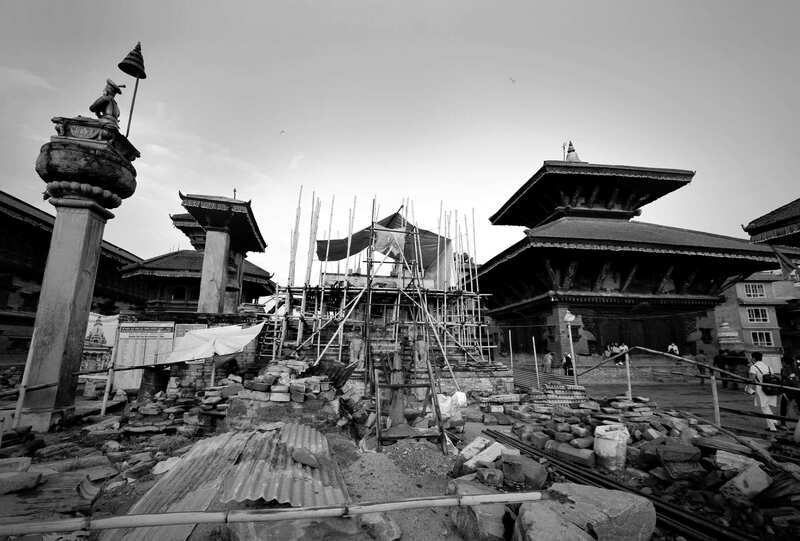 Lack of urban planning, flouting of building codes, and poor quality construction materials plagued structural safety in Kathmandu Valley even before the earthquake. But three years later, it looks like residents have got over the initial shock of the quake, and have forgotten about safety again. It does not help that the municipal bureaucracy, lack of trained construction workers, and little awareness in the public have made it easy to flout safety codes. That knowledge gap extends to technicians and building contractors as well. Many builders fail to abide by construction guidelines and have improper joints, don’t insert enough iron rods to give beams and columns required strength, do not mix cement in the proper way, and do not allow enough time for curing. Population pressure due to rampant urbanisation, greed of flat-owners and the need to cut costs may turn most of old Kathmandu Valley structures into death traps in the next big earthquake. 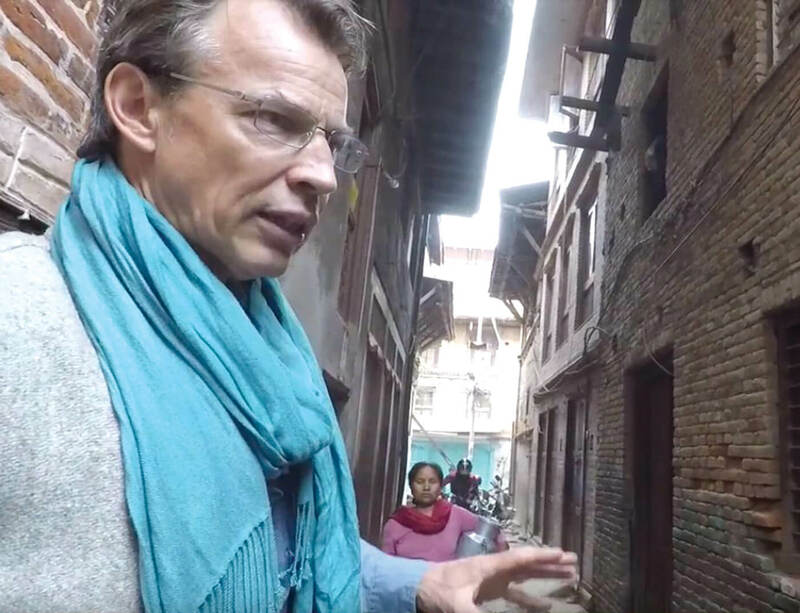 “This is actually very badly mixed concrete, it is too sandy and does not even bind well together,” says Feenstra, pointing out a poorly patched wall, with chunks of cement falling off. As the architects exit a narrow alley, they come across a man praying at a roadside shrine, rubbing vermilion on his door frame to protect his home which was badly damaged in the 2015 quake and still propped up by timber beams.